Twelve people in the D.C. area stole money and thousands of credit card numbers from unsuspecting people, the FBI says. 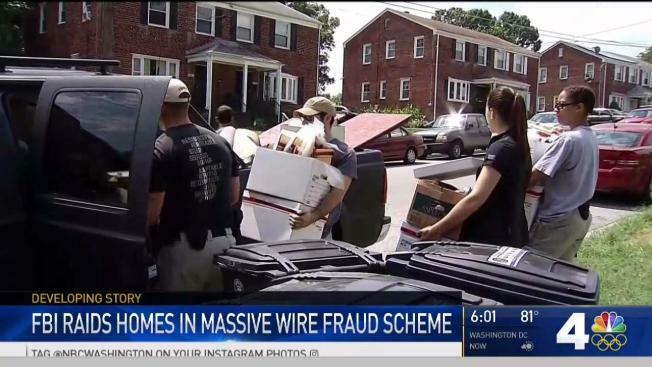 The FBI raided two homes in Prince George's County, Maryland, early Thursday as part of an investigation into a massive scheme involving stolen credit card numbers. A dozen people face federal charges after they allegedly bought thousands of stolen credit card numbers online, manufactured fake cards with the numbers and then used the cards to buy cartons of cigarettes that they resold for cash. One home on the 8600 block of Devon Hills Drive in Fort Washington was searched. A second home, about 7 miles to the northeast, on the 2400 block of Saint Claire Drive in Temple Hills, also was searched. Suspect Rodriguez Rodney Lomax Norman lived there. The FBI hauled out boxes from the house in Temple Hills. Neighbors of that home said they saw authorities take dogs away from the property. What appeared to be cages could be seen in the backyard. FBI agents left the house carrying poles with animal hides attached to them. According to dog-fighting websites, the poles are used to strengthen dogs' jaws and necks. The FBI searched additional locations, a spokeswoman said. Information was not available immediately on those locations. The FBI believes the accused criminals operated for more than two years, starting in March 2015, court documents say. They spoke about their crimes in detail in text messages and in phone calls intercepted by the FBI. An investigation into two of the suspects began after a gas station attendant in Manassas Park, Virginia saw a member of the group with 50 to 60 credit cards and called police with that man's license plate number. D.C. police pulled over the man and found hundreds of credit cards and dozens of cartons of cigarettes inside the car, court documents say. Eugene Orlando Cuffee, aka Gene.